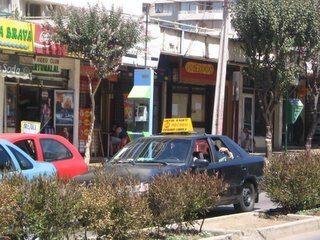 In Valparaiso, the city of a hundred hills (its not really called this, but it sure feels like there are that many)there are a number of ways to get around. One can take a ¨micro¨ an exhaust spewing small bus that seats about 20, a car, if you have one, or, my favorite, the collectivo. A collectivo is a cab/carpool service hybrid. When you walk to the street these little renault or toyota or nissan black sedans cruise around with big signs on top. The signs have a number, something between 1 and 300, and a bunch of names of hills. when you see the name of the hillthat you want, you raise your hand and (if the car isn´t full) the driver pulls over and you hop in and tell him where you want to go. during the day you pay 400 pesos (here 530p=1$) and 600 after midnight and the collectivo will take you home. Plaza Esperanza (where i´m staying) is conveniently located right on the border between vina and valpo, and no matter which city you´re in, you can catch a collectivo with the ¨Recreo¨ sign on top and it will drop me home. Becasue Recreo is the neighborhood between the to cities, many collectivos go through there on their route, therefore it´s really easy to get home. Today, after morning class, I was hurrying home to be back by 11 for yoga class. I grabbed a collective on the main street in Vina del Mar. As the guy was driving, he kept flitting with the radio and cursing. Finally he pulled over, got out the car, ripped some cords from his engine, then returned to the car, handed me 250p and told me to get out. Apparently something was wrong with his car. SO I began walking toward home, 15 seconds later, another ¨recreo¨collectivo drove by, so I hailed it down. I got in, only paid $300p (because we were almost home) and he took off. At the base of the hill, though, this guy pulled over, and he too gave me back some money and told us (there were 3 others) all to get out of the car. Luckily, I was close to home so I could walk the final few minutes, but I was 10 minutes late for yoga. oh well. The hills here are very steep, so it makes sense that a cars transmission would fail regularly. Last night, Frank and I went into town, and the collectivo home was a speed demon. He whipped us through the barron streets of Valpo putting his pedal to the metal and not letting up when going around corners. WE got home in a jiffy, telling the driver ¨que fuerte!¨ (what strength!) he snickered. Though clearly dangerous, these collectivos seem safer than the micro bus alternative.